Yes, subject to certain limitations under the VRA Act and IRS regulations. Download "Yes, subject to certain limitations under the VRA Act and IRS regulations." 2 documentation. VPFP bonds are issued, at a minimum, each spring and fall with funds available typically in early June and early December. 8. 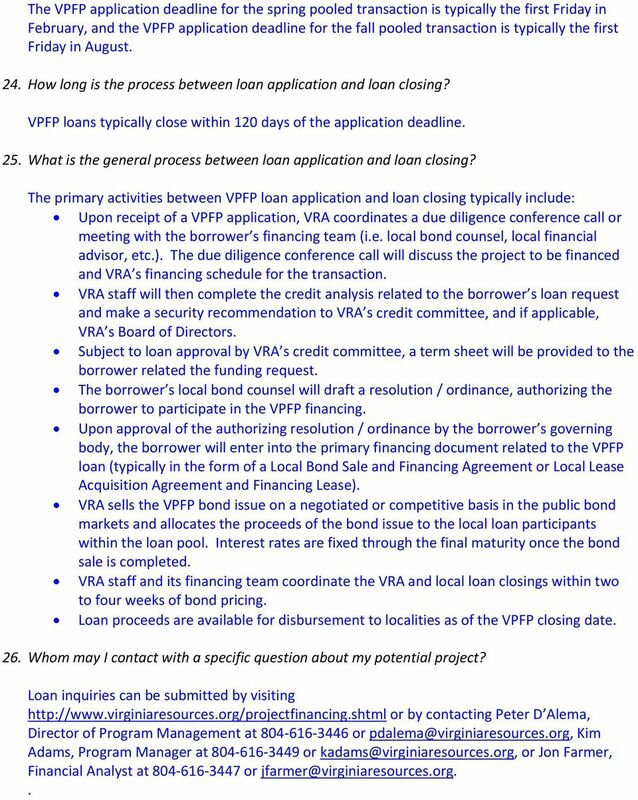 How are VPFP loans funded? VRA obtains funds for borrowers through the issuance and sale of VPFP bonds in the public debt markets. VRA issues bonds, at a minimum, each spring and fall using a senior and junior lien structure under the VPFP master indenture of trust. 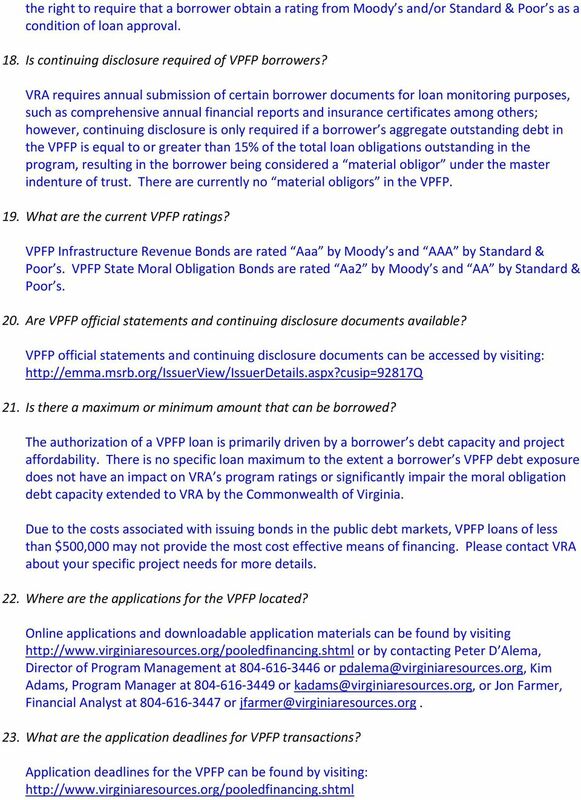 VRA issues two types of bonds under the VPFP: Infrastructure Revenue Bonds (senior lien) and State Moral Obligation Bonds (junior lien). The senior lien Infrastructure Revenue Bonds represent approximately 70% of the total bonds issued in each VPFP bond transaction and have a first lien on 100% of the borrower loan repayments. This structure provides approximately 1.43x coverage for all of the Infrastructure Revenue Bonds. 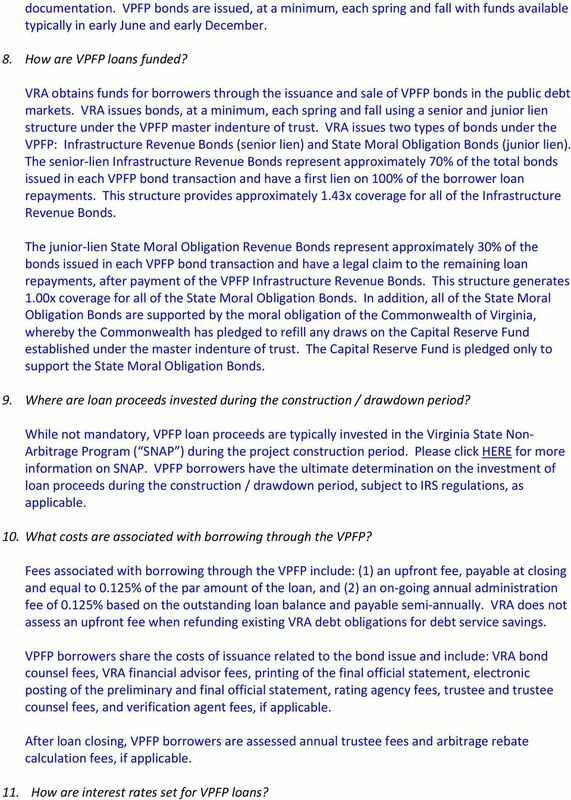 The junior lien State Moral Obligation Revenue Bonds represent approximately 30% of the bonds issued in each VPFP bond transaction and have a legal claim to the remaining loan repayments, after payment of the VPFP Infrastructure Revenue Bonds. This structure generates 1.00x coverage for all of the State Moral Obligation Bonds. In addition, all of the State Moral Obligation Bonds are supported by the moral obligation of the Commonwealth of Virginia, whereby the Commonwealth has pledged to refill any draws on the Capital Reserve Fund established under the master indenture of trust. The Capital Reserve Fund is pledged only to support the State Moral Obligation Bonds. 9. Where are loan proceeds invested during the construction / drawdown period? 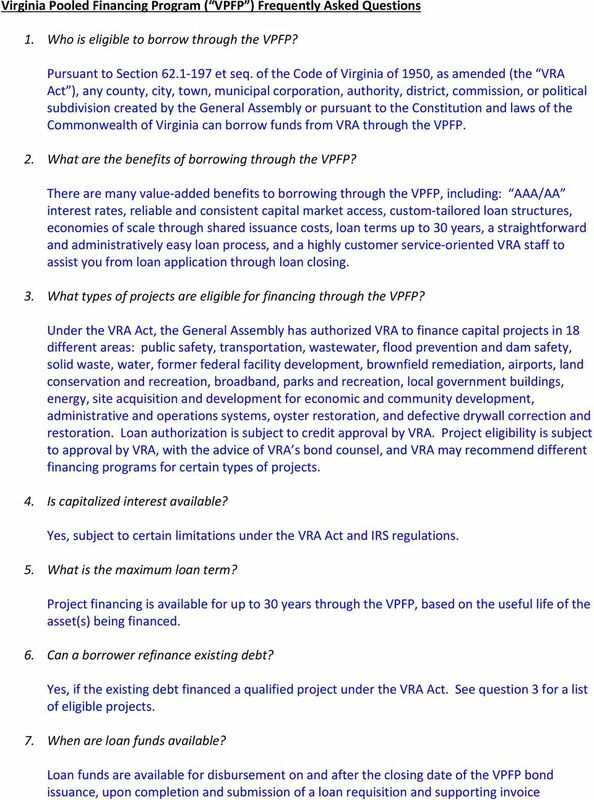 While not mandatory, VPFP loan proceeds are typically invested in the Virginia State Non Arbitrage Program ( SNAP ) during the project construction period. Please click HERE for more information on SNAP. VPFP borrowers have the ultimate determination on the investment of loan proceeds during the construction / drawdown period, subject to IRS regulations, as applicable. 10. What costs are associated with borrowing through the VPFP? Fees associated with borrowing through the VPFP include: (1) an upfront fee, payable at closing and equal to 0.125% of the par amount of the loan, and (2) an on going annual administration fee of 0.125% based on the outstanding loan balance and payable semi annually. VRA does not assess an upfront fee when refunding existing VRA debt obligations for debt service savings. 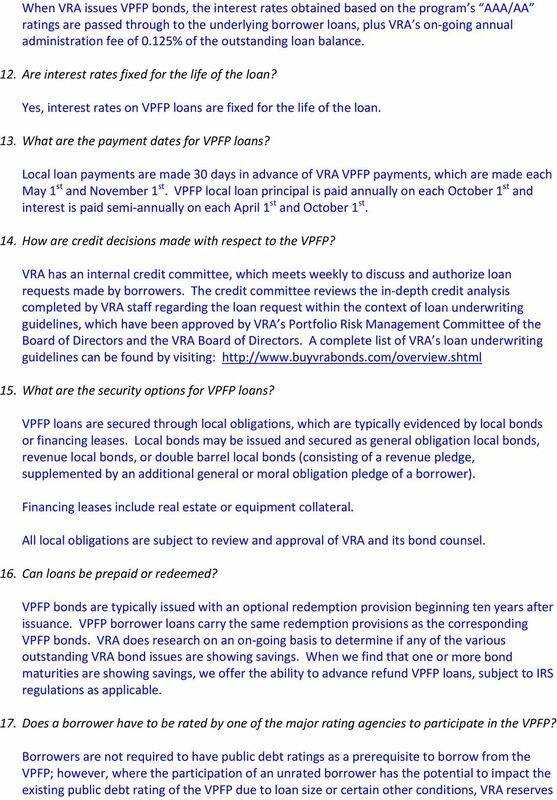 VPFP borrowers share the costs of issuance related to the bond issue and include: VRA bond counsel fees, VRA financial advisor fees, printing of the final official statement, electronic posting of the preliminary and final official statement, rating agency fees, trustee and trustee counsel fees, and verification agent fees, if applicable. After loan closing, VPFP borrowers are assessed annual trustee fees and arbitrage rebate calculation fees, if applicable. 11. How are interest rates set for VPFP loans?